Wow, what a year we've had with this Block of the Month. 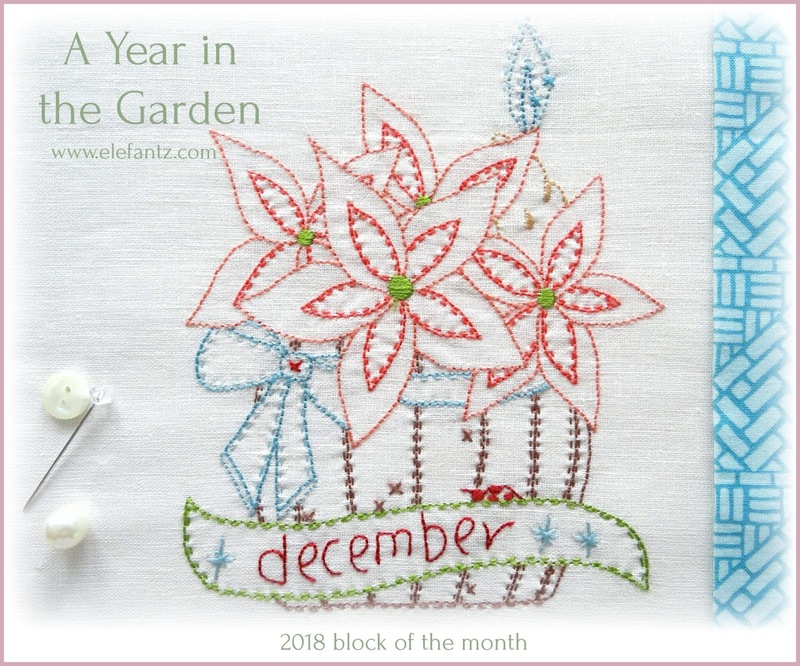 Back in January, when I shared the first block for A Year in the Garden, December seemed sooooo far off...yet here we are at the end of this project and not only can you stitch the final month but you can bring all those blocks together and make a quilt. The pot of poinsettias in December's design was my nod to this beautiful Christmas season which is almost upon us. Many of the shops near me have begun selling pots of them in preparation for festive decorating and table centres and I'm pretty sure one of those poinsettias pots will find it's way home with me later in the week. Included with your stitchery pattern this month are the finishing instructions to bring all twelve blocks together in a simple quilt. "A Year in the Garden" finishes at 40 x 53 inches, a nice lap size. Just as I kept the fabric choice and embroidery colours to a minimum when designing and stitching A Year in the Garden, so I continued with the finishing. Each block is displayed almost like a window so all the detailed work from January to December is easily given centre stage - after all there's a lot of time and patience which goes into an embroidered project like this so let your handwork shine. The backing is the same rusty tonal fabric I've used around each stitchery block and the binding is the same floral as the wider borders. 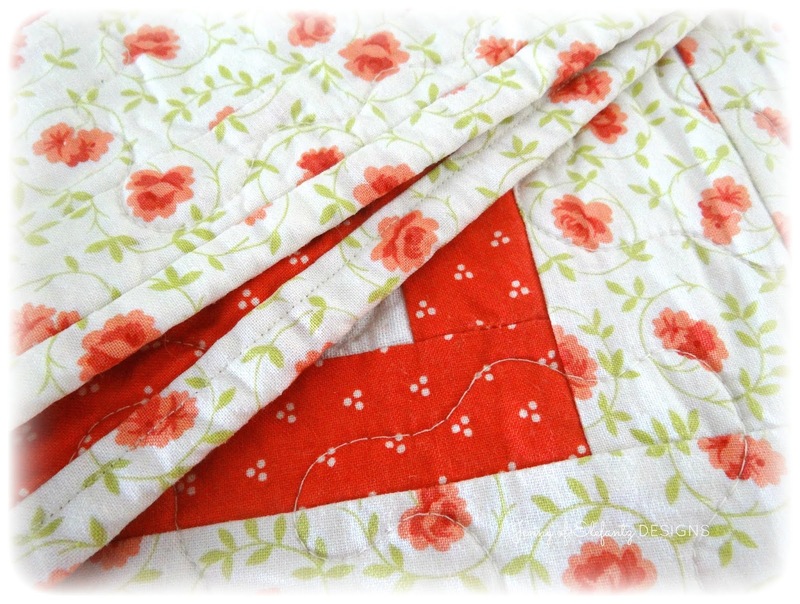 When I was taking photos of backing and binding yesterday I had to laugh because this quilt gets used and has been washed a few times...so it's crinkly, loved. Just as a quilt should be. I originally made A Year in the Garden late in 2015 and had it quilted early the next year. It's been out on the couch, rugged around sleeping babies or hung over a chair ever since. Always just within reach should a little one (or a sleeping pregnant daughter) need to be covered. In fact all my quilts are being used and loved. 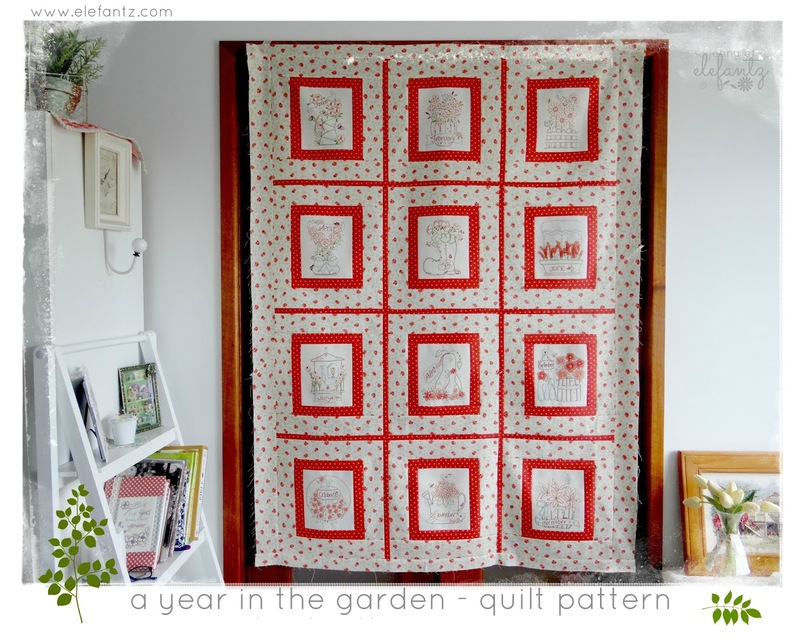 Aisha, Kezzie, Anita and Blossom all have 'quite a few' quilts I've made for them and their children, and because they have seen me regularly use quilts in my own home they freely use theirs. It blesses me to see photos of Frankie, Austin, Aminah, Deegan, Calab, Cully May and Rafaella sleeping under a Nana quilt. I guess you'd like the pattern now, yes? This pattern will be free until the end of 2018. The January to November patterns are $2 each in my shop until the end of December, however, from January 1st all twelve embroidery patterns will be $4 each. If you've missed any this year you can see them over on the 2018 BOM page or go straight here to my shop and catch up. One of the ways you can always stay up to date with what's happening on Elefantz plus receive the occasional bonus freebie is to sign up for my free weekly newsletter. There's a lot to come in 2019 so just pop over here and we can keep in touch! Hope your week is a good one and that you stop each day for a few minutes to breathe deep and count your blessings. I find that tends to lift my weariness and my heart on more days than I can count. I love the December block. 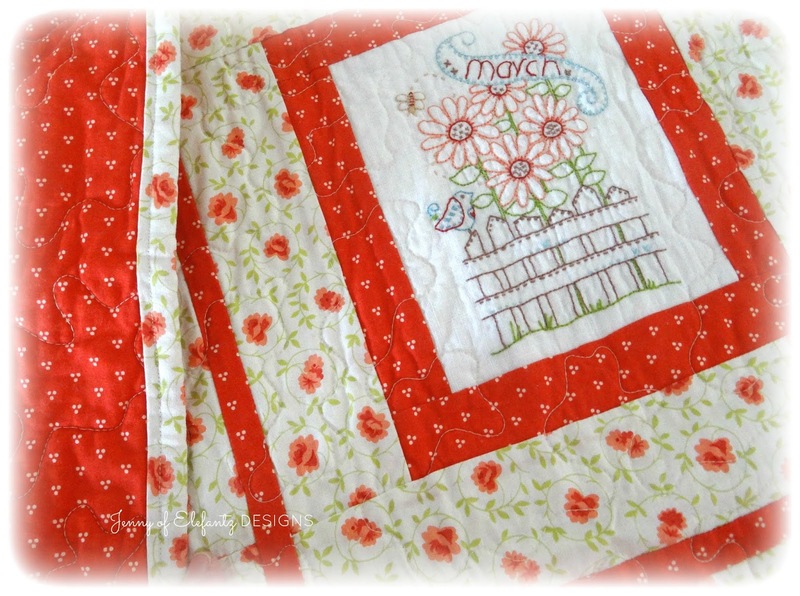 Beautiful quilt and I love that you use it!! I'm with you, please wear out that quilt I made you!! That's why we make them. If I find that someone I made a quilt for doesn't use it, they won't be getting another. Hello Jenny, The quilts you are showing us are all beautiful and made even more so by the use of love and comfort! I am still far behind on the Block of the Month for this year. Mainly because I decided to completely color in my patterns, like Crewel Embroidery. Yet, due to the fact that I am using DMC Floss and not Wool, they techniquely are not called Crewel Embroidery but Surface Embroidery. It is a technique I am trying to learn more about and learning so many new ways to use embroidery stitches. 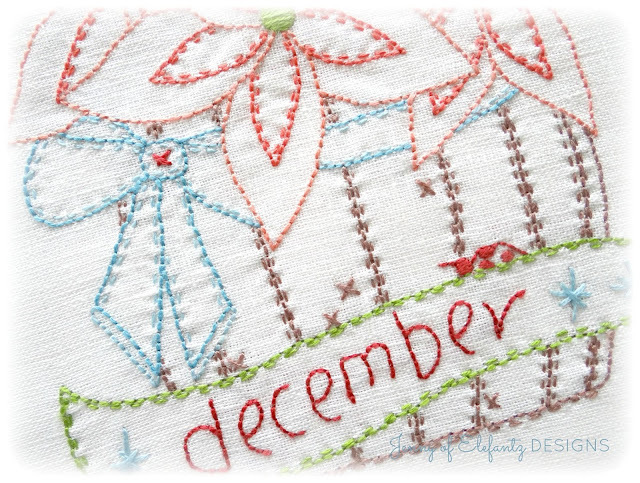 I love the patterns that you share and am looking forward to next years stitch along also! I am so delighted to have discovered your blog and have learned so much from you! Thank you for your continued posts and lovely patterns! I wish you a fantastic day! Thank you for another great block to close out this EOM! I have kept mostly up to date. Just a wee bit of November's to finish. Meanwhile, I start thinking of which threads I will use for December. This will be my first big embroidery project, so thank you Jenny, for offering these EOMs, and getting me back into an old love. I'm totally anxious to see what you have in store for us for 2019! Thank you so much for this final beautiful block. I love seeing your quilt, finished and beautiful and used! The children are adorable, of course! 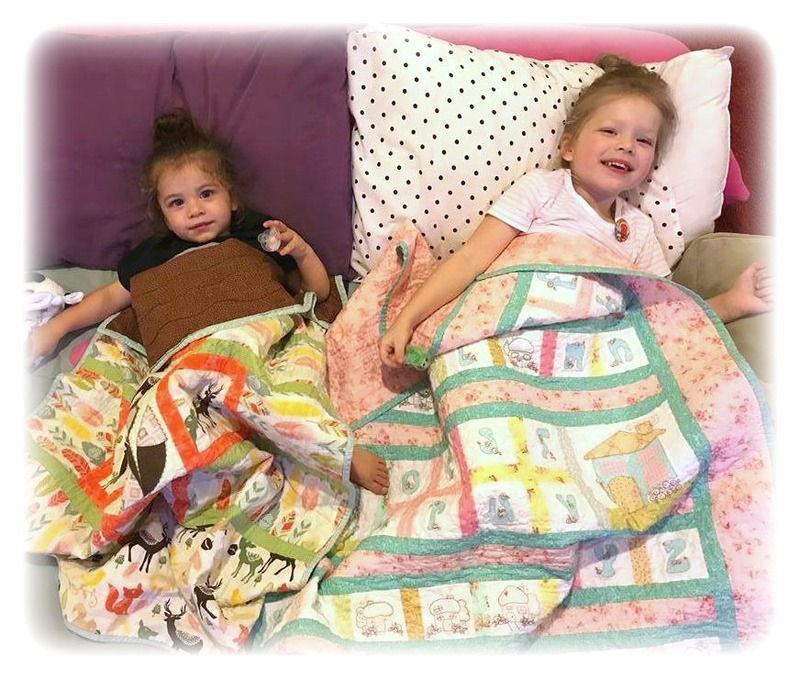 How sweet they look with their quilts. Love December with the poinsettias. Maybe next I can try my hand at some of your embroidery patterns. We'll see once I get moved how it goes. All your patterns are sew pretty. Thanks for always sharing. 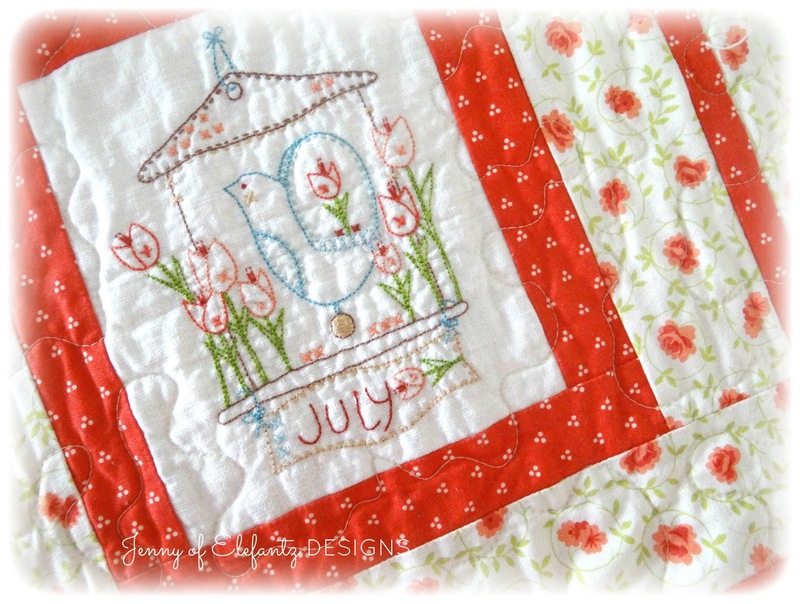 Jenny, your quilting is simply amazing! As are your patterns. How very lucky your family is to receive such beautiful gifts made with so much love and talent. They will be always treasured Im sure! Just read your newsletter and wanted to Thank You So Much for Everything you do for us. Looking forward to what 2019 brings. I am so happy about the changes in your life... not that I wanted things to change, but change, they must. Prayers for fulfilling your goals and living the life you were meant to live.